What happened on April 15, 2013 is unimaginable. As a Bostonian, Patriots Day is the best day in Boston. Anyone from Massachusetts will tell you their favorite place along the route to watch the marathon: St. Ignatius church at Boston College is my place. Marathon day for me has always been spent at Boston College! Over the years, I’ve cheered on Johnny Kelley, Bill Rodgers, Uta Pippig, my Uncle Ron, Jenny Deane, the Hoyts and many more. The runners have just finished climbing and descending Heartbreak Hill. Plus, it marks five miles left until the finish line – the perfect place along the 26.2 mile route! In December 2002, I had defended my dissertation at Boston College and was working at the Campus School on the EagleEyes program. That winter, I decided to train and run the for the Campus School. It was an extremely cold winter, but I made it through the frigid temperatures and water bottles freezing on long runs because of my running partner Gaby, a junior at BC and a loyal volunteer at the Campus School. 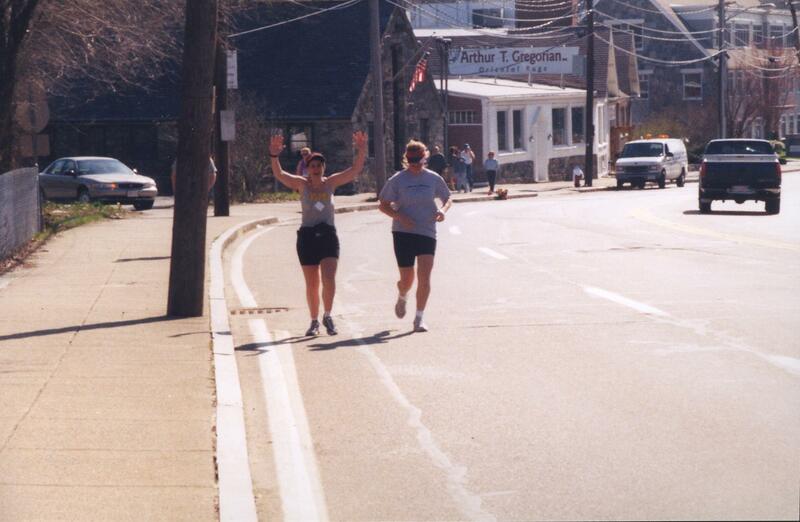 Our typical route was two laps up and down and all around Heartbreak Hill. We had thought that if we trained on Heartbreak Hill as a regular run that we’d be mentally ready to conquer it on race day. The days I ran with Gaby were full of hope and promise, not to mention lots of laughs and so much fun! Ready for race day, my adrenaline was pumping! The rhythm of pounding feet, your heartbeat and hearing your own breathing in synch – it’s a beautiful thing! The crowds were cheering, music was blaring, American flags were waving and I was in the running zone! It was a glorious day to run. But, somewhere between the 8-10 mile mark my right leg was tight. I stopped to stretch and the minute I put pressure back on my right leg, my knee buckled. I was all done. My race was over and I would not cross the finish line. I did however, get to go through extensive physical therapy for my IT band injury. Failure is powerful thing, so is fear. Since 2003, I’ve avoided running outside and have remained safely on a treadmill. For cover, I blame my bad knee, but in honesty I’ve been afraid to fail again. I’m hoping by admitting it and addressing it, that I can finally overcome it. 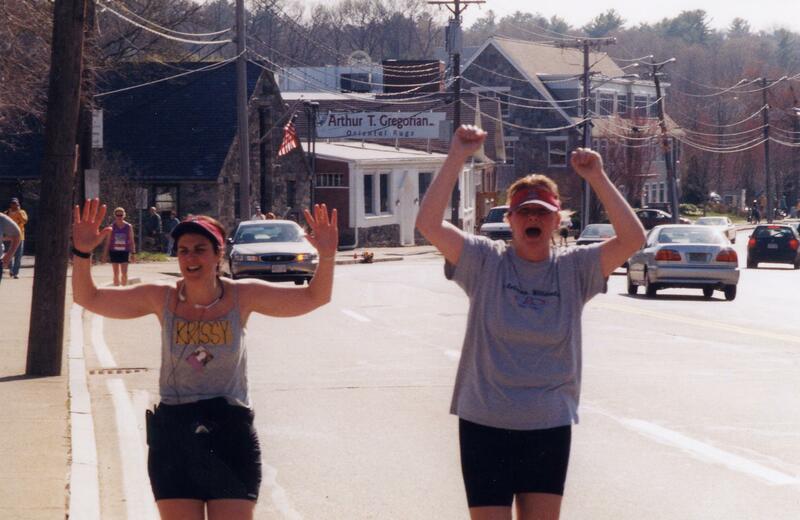 What happened in Boston this year makes me want to conquer my fears and finish what I had started in 2003. Plus, I want to finish it for all those who were unable to finish it this year. I’m ready to lace up and hit the pavement running! It might take me until midnight to cross the finish line in 2014, but I’m determined this time! Hoping the Campus School will take this proud alum back as a runner! I will make it up Heartbreak Hill! I will proudly pass St. Ignatius Church and I will cross the finish line!